Undergarments are worn beneath the outer clothes and help to avoid soiling of outerwear. Men’s undergarments are generally of two types, which include upper wear and lower wear. For undershirt, we include vests, sleeved vests and muscle vests. For briefs, we include regular briefs, trunks and boxer shorts. In winters, long underwear is preferred to provide extra warmth. This report covers global men’s underwear market performance in terms of revenue contribution. This section additionally includes PMR’s analyses of key trends, drivers, restraints and opportunities, which are influencing the global men’s underwear market. Impact analysis of the key growth drivers and restraints, based on the weighted average model, is included in this report to better equip and arms clients with crystal clear decision-making insights. Growing disposable income, preference for branded underwear that offers better fit and comfort are major factors driving demand for premium underwear, thereby fuelling the growth of the men’s underwear market. Major trends in the men’s underwear market are increased the adoption rate of functional underwear, consistent investment in branding and marketing and the surge in acquisitions and mergers. By age group, the global men’s underwear market is segmented into ranges such as 15-25, 26-35, 36-45, 46-55 and 56-65. Of these, the 36-45 segment accounted for over 24% share of the overall men’s underwear market in 2014, followed by the 26-35 segment. By distribution channel, the global men’s underwear market is segmented into online and offline channels. Offline is further sub-segmented into a mass merchant, speciality store, mono-brand store and others. 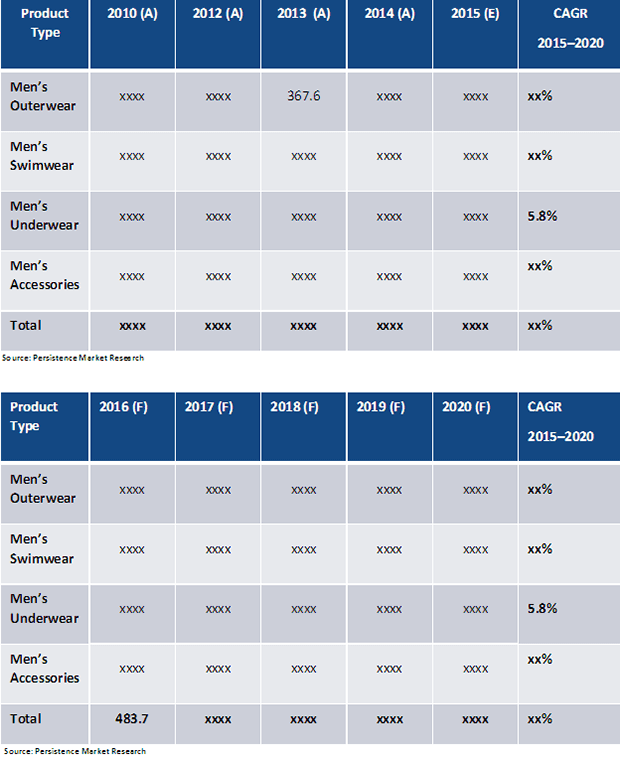 Among all the aforementioned sub-segments, mass merchant sub-segment is expected to dominate the men’s underwear market, accounting for around 53.8% share of the overall market by 2020 at a CAGR of 4.5% during the forecast period, i.e. 2015-2020. Undergarments help to avoid soiling of outerwear are generally of two types: upper body and lower body garments, which cover the torso and waist and legs respectively. For undershirt, we include vest, sleeved vest and muscle vest. For briefs, we include regular briefs, trunks and boxer shorts. In winters, long underwear are preferred to provide extra warmth. Growing disposable income, preference for branded underwear that offers better fit and comfort are major factors fuelling demand for premium underwear, thereby driving the growth of the men’s underwear market. Major trends in the men’s underwear market are increased the adoption rate of functional underwear, consistent investment in branding and marketing and a surge in acquisitions and mergers. The high degree of competition and unorganised market in developing countries are major factors hampering the growth of the men’s underwear market. The global clothing and accessories market was valued at around US$ 1,229.4 billion in 2014. The men’s clothing and accessories market accounted for 38.7% of the global market in 2014 and was valued at US$ 437.7 billion. Revenue contribution by the men’s underwear market to the global men’s clothing market was US$ 8.0 billion in 2014 and is expected to increase to US$ 11.7 billion by the end of 2020 at a CAGR of 5.8%. Organised retail penetration and penetration of mono-brands and multi-brand outlets worldwide is driving sales of branded clothing products. Key market players covered in this report are Hanesbrands Inc., Philips-Van Heusen Corporation, Ralph Lauren Corporation, Jockey International Inc., American Eagle Outfitter Inc., Iconix Brand Group Inc., J.C. Penny Corporation, Inc. and Berkshire Hathaway Inc. Major players in men’s underwear market focus on enhancing their global and regional presence through acquisitions and mergers and operational expansion. Major players in men’s underwear market focus on enhancing their global and regional presence through acquisitions and mergers and operational expansion.